The advantages of airline competition to consumers are clearly apparent. Lower fares, greater choice, more frequent flights and a wider range of available services have all been evident when the entry of a new competitor has occurred. In many instances however, after an initial, relatively short-lived, period of aggressive competition the new entrant has either gone bankrupt or found a less stressful existence co-operating in some manner with the incumbent. 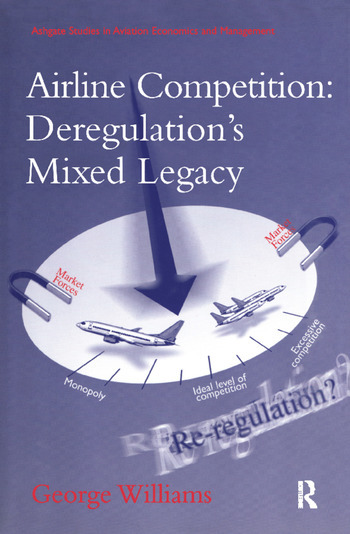 In this wide-ranging book, the author looks at the competitive arena in the post-regulation era and especially focusses on deregulation’s legacy; globalization in a bilateral world breaking the link between nationality and airlines. The book is of special interest to those members engaged in the Airline Industry, Regulatory Authorities and Government Departments of Transport and Industry. It will be of value to academic specialists in transport economics and public policy; MSc students and Institutes of Transport; pressure groups and the Travel and Tourism Industry. Contents: Introduction. Extent and impact of deregulation; Impact in European domestic markets; Impact in other regions’ domestic markets; Impact of low cost carriers in Europe; Europe - the world’s first fully deregulated region; Air transport provision in remoter regions; Competition on the North Atlantic; Prospects for global deregulation; A new role for regulators; Conclusion; Index. George Williams, Senior Lecturer in Air Transport, Air Transport Group, Cranfield University, Beds, UK.